Bronze bas-relief of the late 17th, (1670-1690) "Sagrada Familia con San Juanito", chiseled in the dress of the Madonna, flemish school. 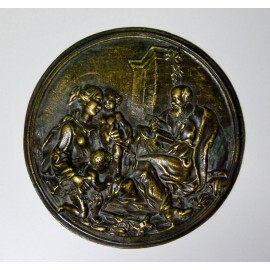 Antique bronze round bas-relief of the late seventeenth century, (1670-1690) "Sagrada Familia con San Juanito", chiseled in the dress of the Virgin, flemish school. With its patina, good condition.